“Every asset should be connected: doors, shoes, chairs, everything!” Ludovic Le Moan, CEO of Sigfox, is an ambitious man. His previous company, Anywhere Technology, used GPRS to connect early IoT sensors in networks. Sigfox takes that further, using low-power radio devices to add sensors to everything from burglar alarms to shipping containers. With intelligently-networked sensor modules costing as little as 20c and consuming very little energy, it's easy to understand Le Moan's goal of connecting everything – literally everything. The company already has a presence in 39 countries, with full nationwide coverage in 17 of them. Le Moan is not alone. Something has stirred in France. 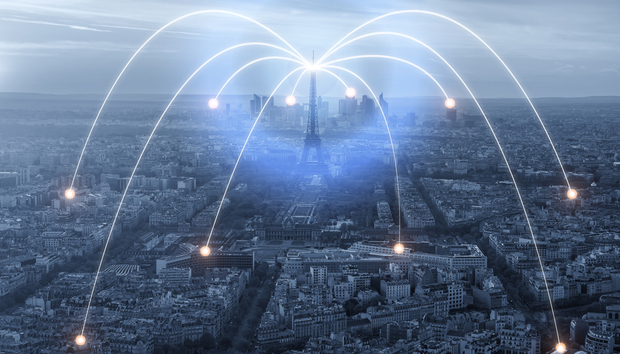 A blend of ambition and technological know-how has driven French IoT startups from humble beginnings to international success. Sigfox is perhaps the most well-known, along with drone company Parrot, but there are many more. La French Tech distributed as a PDF [pp6-17] describes 130 tech startups at Web Summit 2017 in November. Not all were pure IoT companies but the majority were IoT-related, ranging from FinTech to healthcare, big data to automation. « Is the influence of Gartner, IDC and Forrester on CIOs waning?